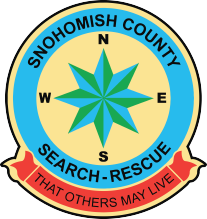 Randy Fay, Snohomish County Volunteer Search and Rescue President While we are still actively engaged in the 2017 rescue season, I have been reflecting on the year to date. We started off at a frantic pace as the late snow melt created problems for climbers and hikers anxious to get into the mountains and this resulted in many rescues. From mid-season until now we have had an unsettling number of tragedies to deal with in water related accidents. Now we face the transition into our Fall and Winter outdoor activities seasons. Time for all of us to lay out our gear and start advanced planning related to the hazards and challenges that the colder weather will bring to the surface. It is more important than ever to carry your 10 essentials plus. Hypothermia is our greatest enemy in the cold and wet weather of the northwest and is a strong contributor to having a worse outcome in an emergency. Please plan carefully and prudently. SCVSAR will be well prepared to help should you encounter unexpected difficulties. Our teams are constantly training for the challenges that each season brings. Enjoy the Fall season in the mountains and stay safe.